Perfect your cakes, breads and roasts with chef-friendly features and 11 specialized oven modes. TwinVection™ Technology utilizes dual convection fans to enhance heat and air circulation for perfectly balanced temperature control. Two full-extension, telescopic professional oven racks with six-position rack supports glide easily and offer convenient access. And the soft-close oven door eliminates slams and ensures that the door closes fully to secure heat inside with counterbalanced assisted closing. Touch control display offers ease of use and precision control. 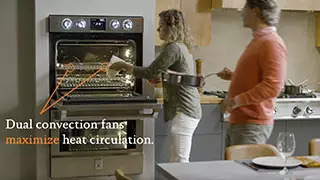 TwinVection™ Technology maximizes air circulation while balancing heat distribution with dual convection fans. 11 high-performance oven modes: Convection Bake, Convection Broil, Convection Roast, Pizza, Bake, Broil, Dehydrate, Proof, Defrost, Warming, Clean. Hidden/recessed bake, broil and convection elements allow for easy cleaning. Soft-close oven door eliminates soufflé-crashing slams and ensures that the door closes fully to secure heat inside with counterbalanced assisted closing. Extra-wide glass pane helps you keep an eye on things while keeping exterior temperature cool to the touch. Porcelain enameled oven interior provides even heat distribution throughout and ease of cleaning. Two full-extension, telescopic professional oven racks with six-position rack supports glide easily and offer convenient access. Angled oven door, end caps and handle are ergonomically designed for easy opening and closing of oven door. Standard meat probe provides accurate temperature measurement. Backlit patent-pending knobs enhance both visibility and style. TwinVection™ Technology enhances air circulation while balancing heat distribution with dual convection fans.